Discovery Shopping Mall or Centro is strategically located on Kartika Plaza street, adjacent to Discovery Kartika Plaza Hotel and MUSRO, and opposite the water recreation center, Waterbom Kuta Bali. The mall, located approximately 10 minutes from the airport and 45 minutes from the city center, houses dozens of famous fashion outlets, five-star restaurants and worldwide fast food outlets. Famous fast food restaurants flood the front of the Centro, namely Burger King, KFC, Starbucks, Domino’s Pizza and Pizza Hut. 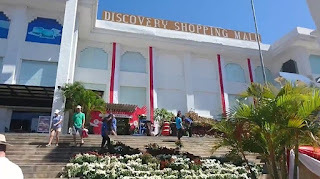 Going deeper, you'll find rows of fashion outlets that are undoubtedly popular, such as Polo, Surfer Girl, Quiksilver, Billabong, Body N 'Soul, Guess, Esprit, Giordano, and many more. The best part of this mall is the open space at the rear which directly leads to Kuta beach. You can also enjoy the most amazing sunset views while dining at the Celsius Café located on the third floor. And in the mall yard, you can also enjoy live music.